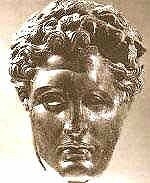 Hephaestion was a Macedonian nobleman, closest friend and alledged lover of Alexander the Great. Born in Pella, the capital of Macedonian, Hephaestion was educated at the court of King Philip and became a childhood friend of Alexander. It was commonplace in this era for men to have male lovers although Alexander's mother Olympias was very jealous of his relationship with Hephaestion. The envy of all the court officials made Hephaestion an isolated man, dependent on and totally loyal to Alexander. Hephaestion accompanied Alexander the Great on many of his victorious battles, however, it is probable that Hephaestion was a better strategist and diplomat than commander. In 324B.C. Hephaestion fell ill and died. Alexander was shocked and grieved bitterly for Hephaestion, the person who had been closest to his heart.